These are lyrics by Dave Matthews Band that we think are kind of repetitive. Dave Matthews Band's, "I Did It"
If you've heard the song you know what i'm talking about. Dave must've had some serious writer's block with this one. Dave Matthews Band's, "So Much to Say"
Alright, if you have so much to say, why do you repeat that phrase twenty something times! 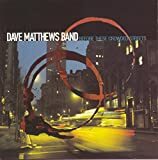 Dave Matthews Band's, "Where Are You Going?" Okay Dave. We get it. You want to know where she's going. Point taken.